Well, what would one expect when moving to Bear Creek Township? While I was off exploring Monhegan Island, my wife sent me this pic. Apparently, this guy showed up around 8 am and hung around the house for a while.. then he headed up the hill toward the neighbor at the end of our drive. We had a bear visit us last summer as well, but he was much smaller.. he was on our back deck.. Yesterday morning we saw a doe with her fawn, and last night, while kayaking on Brady’s Lake, we saw a very active beaver who slapped his tail and dove at least 4 times.. he was a big one! We are really enjoying this living in the country! Monhegan Island – what a pretty house! I have been off to Maine this past week with a group of students from my school. This was our fifth annual community service trip to Chewonki, a camp on the Maine coast in Wiscasset. We worked hard, lugging firewood, cleaning out the hay loft, painting a hallway, pulling thistle from the meadow, milking the cow, donning hip boots and wading into the frog pond to pull out the old docks, putting cedar shingles on an exterior wall, applying bottom paint to the sailboats and more.. it was an exhausting week, but collectively, these trips during the past five years have been the highlight of my career as a teacher. I am already looking forward to making this a cruising destination next summer, once the boat is safe and sound in Maine.. all the more reason to get her in the water and her bow pointed north! The kids had a great time all week, and it was so much fun to be with them. This is just the kind of experience that we older adults need to have in order to re-new our faith in the current generation! Yesterday we returned home from a wonderful camping trip on Cape Code. The intent of the trip was to ride the Cape Cod Rail Trail on our bikes. Originally, we planned to do it as a bike trip, camping along our way, but, instead, we decided to camp at Nickerson State Park and then do daily rides from there. This turned out to be a wise decision. We enjoyed the added comforts of car camping while still riding all but one very rainy day. I can’t say enough about what a neat resource the rail trail is and, Nickerson State Park is a great place to camp, providing an affordable way to enjoy the area. Staying with friends in Rhode Island on the way to the Cape and then again on the way home was an added bonus. We got to explore Newport and we enjoyed laughter and the joys of friendship on each leg of the journey. A bit of “local knowledge” was helpful as our hosts steered us to a wonderful coffee shop that served as the final splurge on the way home yesterday morning.. In addition to celebrating my older step-daughter’s graduation from high school, the trip also overlapped her birthday. 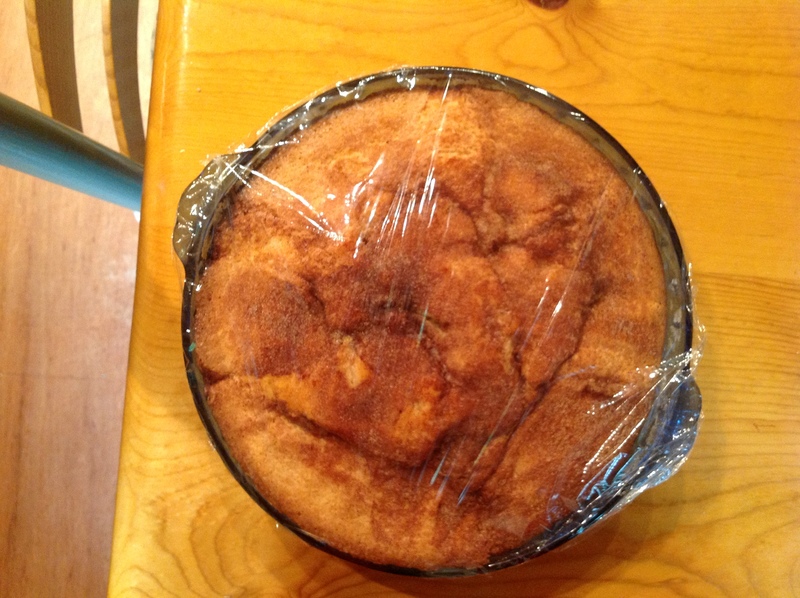 One of her favorite baked goods is Poor Dutchman’s cake which is a recipe that has been passed down from my grandmother. During the drive home, I planned on surprising her with the cake upon her return from a much anticipated birthday dinner date with her boyfriend. It was a significant disappointment, therefore, when I opened the recipe box and could not find the card containing the recipe! I asked my wife to search as well, but she also came up empty handed. Although I had never encountered anyone with a recipe going by the same name, I assumed that an internet search would turn up something, but that ended in failure. I took some delight in the fact that not everything can be found on the internet! I called my Aunt Sue and said ” I have a dilemma , and you might be one of a handful of people in the world who could help me out”! She laughed and remarked that it has been years since she made Poor Dutchman’s cakes, but she found the recipe and mentioned that it was one written in my grandmother’s hand. I was struck by the significance of that.. The recipe could easily have been passed down 50 or more years ago from mother to daughter and saved for all of these years, and thankfully so! And how could I hear that story and not instantly recall memories of visiting my grandparents in Tamaqua PA, entering their apartment, the evidence of freshly baked Poor Dutchman’s cakes permeating the air. I can still see them sitting on the cooling racks in the kitchen.. I want to end this story as a ” happy ever after” kind of story.. to tell you that, just as planned, my step daughter came home and smelled the cakes and smiled with appreciation.. but it did not quite turn out that way.. she had a bit of a disagreement with her mother on the phone before arriving home.. and went immediately up stairs without talking.. 😦 no happy birthday.. no ” thank you , jason” hmm.. so.. i went into the kitchen and cut a piece, still warm from the oven.. and enjoyed it – but not quite as much as if I had been sharing it with her…! And, although I was not around this morning when she got up, I expect that she awoke refreshed, and was very appreciative when she walked into the kitchen and found the cakes.. Such is life when living with teens! just in case.. here is the recipe.. i would love to hear if anyone gives it a try! fill two pie plates that have been buttered and floured. bake 40 minutes at 350 degrees.. goes great with a cup of tea!